In a ballet world filled with white swans, Misty Copeland stands out. As the first African-American female to hold the rank of Soloist at American Ballet Theater in 20 years, Copeland has had an improbable rise. In her new memoir “Life in Motion: An Unlikely Ballerina,” Copeland recounts that journey from poverty to the spotlight of one of America’s top ballet companies. Copeland and her family were living out of a hotel room when she took her first ballet class at the Boys & Girls Club at age 13 — a late starting age for any future ballerina. But in ballet, a young Copeland — one of six children — found her place to shine. Within three months Copeland was dancing en pointe. By 15, she had garnered the attention of major ballet companies — including ABT — by winning the prestigious Los Angeles Music Center Spotlight Awards. Copeland has now danced with ABT for more than 13 years, steadily working her way up from the company’s main Corps de Ballet to Soloist. In 2012, she made history by becoming the first black woman to dance the title role in “Firebird” for ABT, and has since helped launch the company’s Project Plié initiative that promotes diversity in ballet. Copeland has been called a prodigy throughout her career, but she credits her upbringing for giving her the tough skin needed to succeed in the competitive world of ballet. 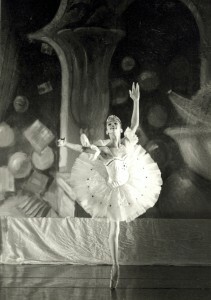 But Copeland has also defied the norm for many ballet dancers in her ability to cross over into mainstream pop culture. She has more than 250,000 followers on the photo-posting app Instagram, she’s performed with music icon Prince, and she was featured in Diet Dr. Pepper “One of a Kind” commercial. This summer, she teamed up with the reality television show “So You Think You Can Dance” as a guest judge, and in the past week, Under Armour’s “I Will What I Want” advertisement featuring Copeland went viral. Whether Copeland will succeed in her goal to become the first female, African-American Principal dancer at ABT remains to be seen. But for now, she’s soaking up the experience of performing some of the roles that go along with that position. Earlier this year, she performed the lead role of Swanilda in “Coppélia,” and she will take on the iconic double role of Odette/Odile in “Swan Lake” when the company travels to Australia at the end of August.